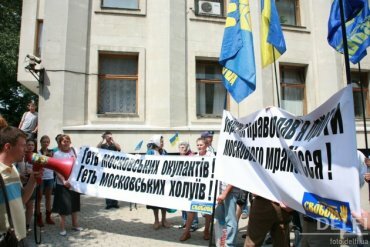 Kiev, July 26, Interfax – Activists of the all-Ukrainian nationalistic association Svoboda (Freedom) held a protest demonstration near the Ukrainian presidential compound in Kiev against Patriarch Kirill of Moscow and All Russia’s ongoing visit to Ukraine. About 30 Svoboda members gathered near a fence that surrounds the presidential compound on Bankovaya Street. They held party flags and several banners saying ‘Down with Moscow occupiers’, ‘For united local Orthodox church with center in Kiev’ and ‘Down with Muscovite colonizer priest’. Andrey Ilyenko, the leader of the Kiev branch of Svoboda, spoke to the audience to explain the purpose of the demonstration. Several policemen deployed at the site made sure that the protesters do not cross the cordoned area. Svoboda earlier planned to hold their protests against Patriarch Kirill’s visit near the Kiev Laura of the Caves Monastery on July 26 and on European Square on July 27, but the Kiev District Administrative Court banned these actions. In response to this, Svoboda called on its activists to gather near the presidential administration building. “We will ask the government why it is groveling before the Kremlin,” a Svoboda activist said. Meanwhile, a court ban on mass actions in the center of Kiev remains in effect until September 1. The ban was imposed on July 3, when protesters against a new language policy bill gathered near the Ukrainian House in the center of Kiev.